We value your business - and we love to reward loyalty! ***UPDATE - Jan.28*** - Several, longtime clients reported issues last night about completing transactions online and wondered about qualifying for Winter Rewards before the deadline. In case others experienced this issue, Winter Rewards has been extended until Jan.31! It's time for the seasonal LOVE your skin event - ANNIVERSARY EDITION! 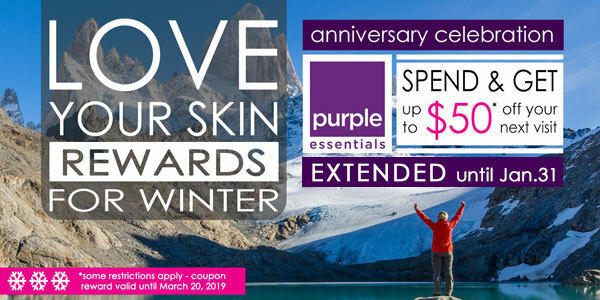 As a small thank you for helping make 2018 our biggest year ever, Purple Essentials is happy to announce Love Your Skin Rewards For Winter. We don't think of it as a discount on our product, we consider it a reward for your loyal support. LIVE PURPLE - LIVE WELL! Beginning NOW, shop online at purple-essentials.com before 11:59pm PST on January 31st - Spend $* in a single transaction - Receive a corresponding coupon code for your next online purchase ... it's that pure and simple! EXTENDED REDEMPTION PERIOD - Your REWARDS earned during the LOVE Your Skin Anniversary Edition for Winter will be valid right up until the first day of Spring - March 20, 2019 ... that's nearly 3 weeks longer than before - we thought you'd like that. Balancing your Skin, Senses & Wellbeing - Purple Essentials Nurtures with Nature! *$'s spent in a single, online purchase - rewards based on total before taxes & shipping and net of any other applicable discounts. Corresponding online Coupon Code valid until March 20, 2019. Coupon Code, along with redemption instructions, will be delivered in a separate email following online transaction.